Plenty of changes happening at Walt Disney World. Here is a round-up of the news as of August 2014! Big changes for entertainment in the World Showcase in Epcot. Off Kilter, Mo’Rockin’, Spirit of America Fife and Drum Corps, and World Showcase Players. There will be new entertainment including traditional Berber music and dance troupe in Morocco, Celtic folk music ensemble in the United Kingdom, flag waving performers in Italy, and a lumberjack inspired show in Canada. The last performances will be taking place September 25 for the World Showcase Players and September 27 for the rest. The American Idol Experience at Hollywood Studios is closing much sooner than originally reported. 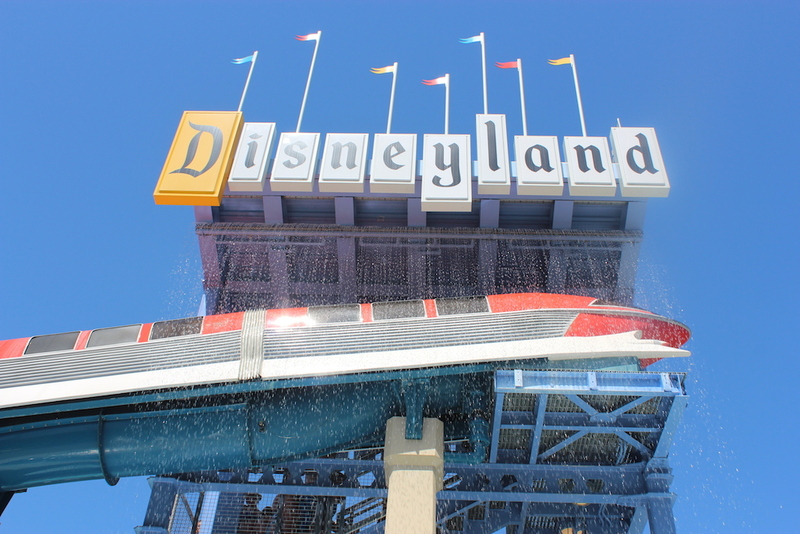 This attraction was slated to close permanently in January 2015, but will actually be closing August 29, 2014 30, 2014. The Festival of the Masters an open-air fine arts festival which was scheduled for Nov 8-10 has been cancelled for this year, 2014. Due to the expansion of Downtown Disney and its change to Disney Springs there isn’t enough room to host the event this year. The Move It! Shake It! Celebrate It! will be changing this fall into the Move It! Shake It! Dance and Play It! Street Party with new characters and music. The change will include the addition of Phineas and Ferb, Stitch but still include classic characters such as Mickey, Minnie, Goofy, and Donald Duck. 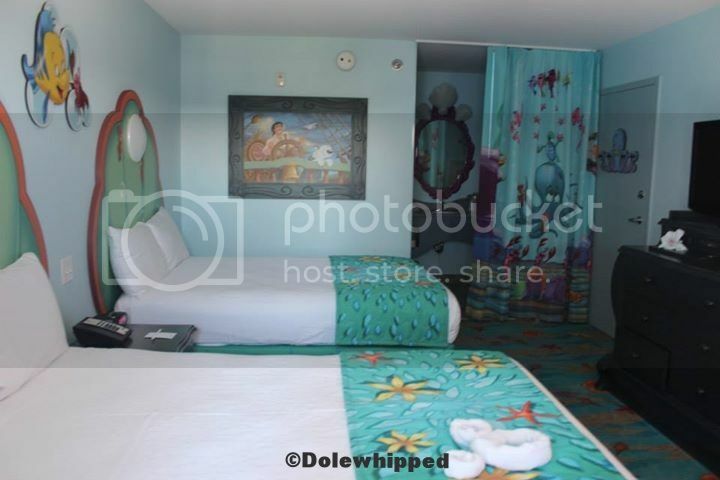 Disney has quietly been remodeling some rooms at the Caribbean Beach Resort. 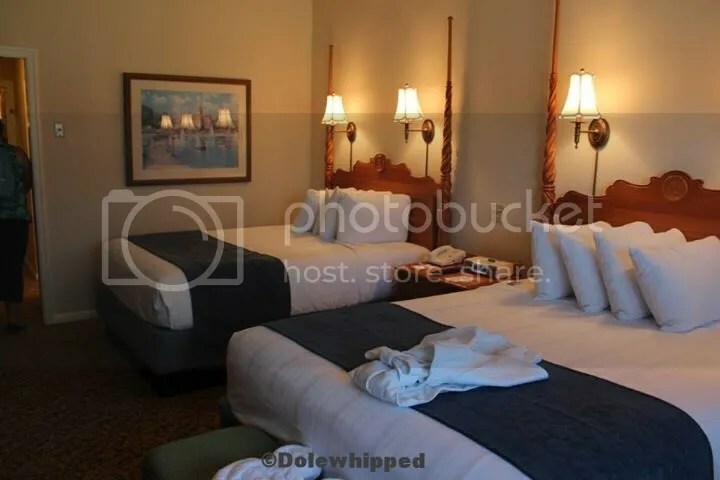 The good news is that some of the rooms that have been finished now have queen sized beds and a 5th bed, the murphy pull down style that we have seen at Port Orleans Riverside. The rooms also feature sliding doors like those at Coronado Spring Resort instead of the typical curtain. We will follow up as more information becomes available. 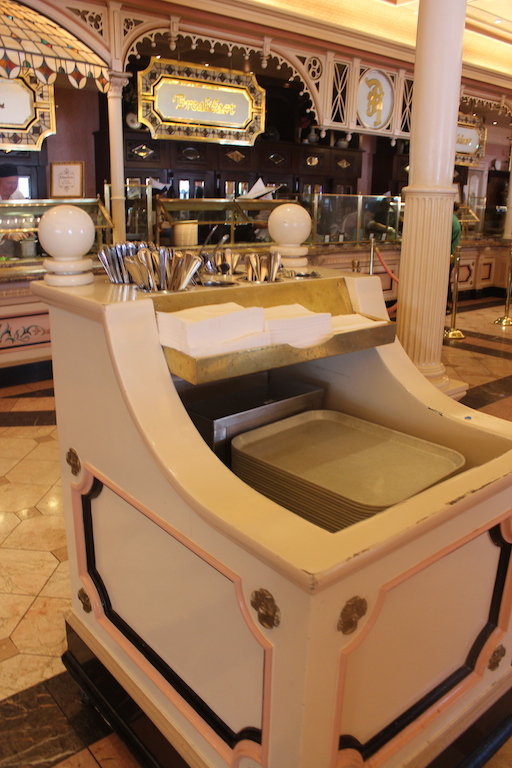 In important Dole Whip news, Captain Cooks at the Polynesian has reopened but with no self-serve Dole Whips in sight! Rumor has it they will be back but in a different location and no more self-serve. You know we are hoping to see them back soon. The Disney Parks Moms Panel will start its search for the 2015 panel starting September 2nd, 2014. The Moms Panel is a bit of a misnomer since there have been previously dads and grandparents on the panel. The Disney Parks Moms Panel is a place where people can submit questions to a specific member or the panel in general about Disney. The panel has members from all areas of expertise including Disneyland, Walt Disney World, Disney Cruise Line, Wide World of Sports, runDisney and Disney Vacation Club. If you think you have what it takes to join the panel check out their website for more information. As a travel agent, it’s very important to me that I find the resort that best fits my client’s needs and the needs of their family. That’s why I’m putting together a series of posts that help you decide which resort is right for you. Are you a “foodie”? Are you always thinking about what’s for dinner…while you’re eating breakfast? If so, this post is going to help you decide which resort is right for you when you’ve got nibbles on your noggin. This post is going to skew Deluxe resort heavy, mainly because there are more restaurants to choose from at those resorts, but hang around because I think you’ll like where I’m going with this. If you’d like to get a small taste of Hawaii, try ‘Ohana. If you go for breakfast, try the POG juice. It’s a guest favorite! 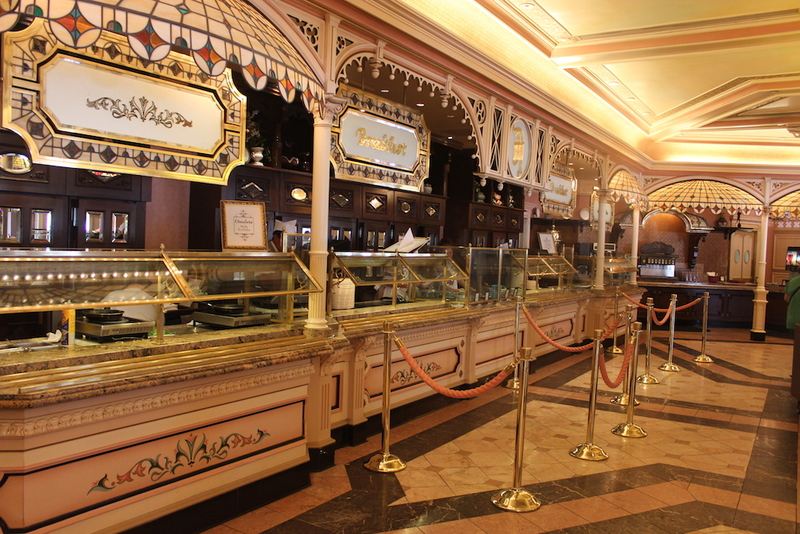 If you stay here, you’ll be on site for one of my favorites, Beaches & Cream Soda Shop! This adorable diner has typical grill fare like burgers and fries, but also has the BEST ice cream on Disney property. If you’ve got some friends and are hungry for some sweet treats, try The Kitchen Sink! Serving a mix of African, Indian, and Mediterranean style cooking, Jiko – The Cooking Place is sure to please those with an adventurous palate. I know a Value level resort seems like an unlikely place to find great food but their food court, Landscape of Flavors, is my one of my favorite quick service stops on Disney property. They have a vast section of dishes from Create-Your-Own pasta to Tandoori Shrimp. Everyone in the family is sure to find something they love. 1) I’m going to cheat right off the bat and name two, but it’s ok, because you can get them at the same location! At Epcot, in France you’ll find the Gran Marnier Orange Slush and the Grey Goose Citron Lemonade slush. Preferably one of each! These drinks are as good as they sound, and are perfect for cooling down after a long walk around the countries at Epcot. 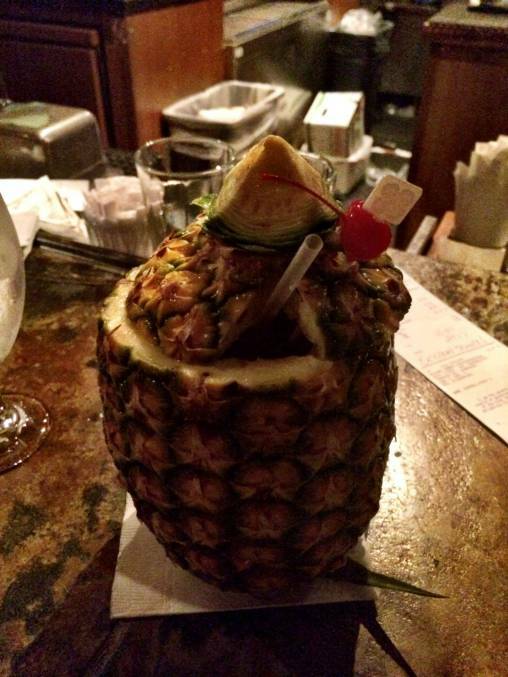 2) The Lapu Lapu. A strong drink served in a cored out pineapple. Need I say more? 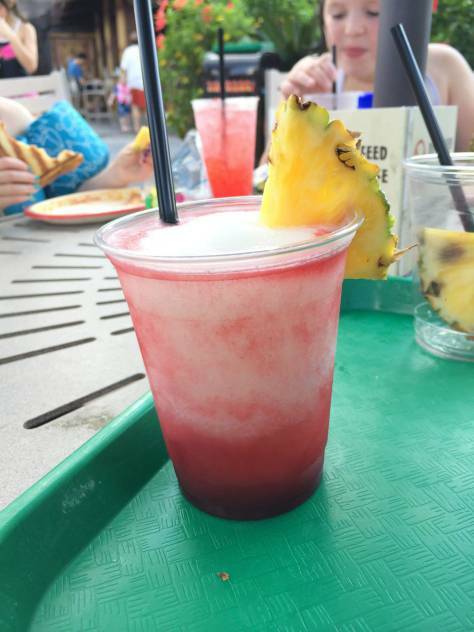 Best enjoyed by the pool at the Polynesian resort! 3) The Pina Colava. This drink is pina colada mix with Stoli Razberi and raspberry puree added. 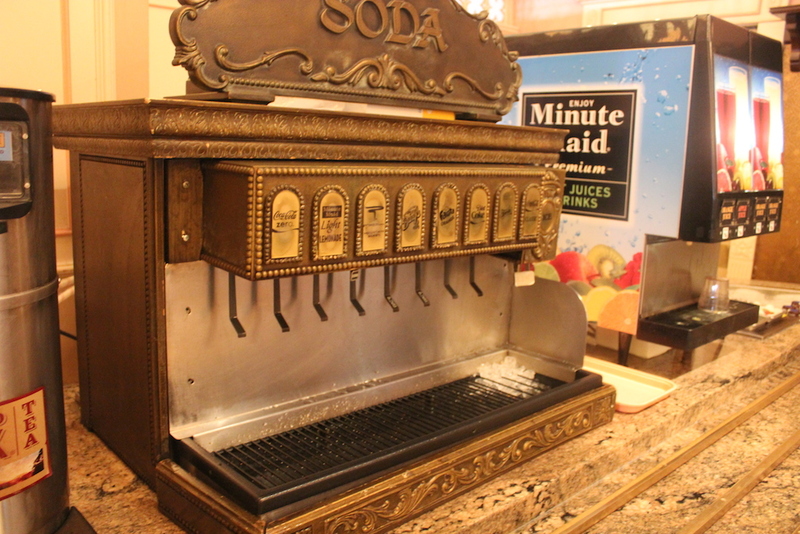 It is absolutely amazing, and can be found at many restaurants and resorts throughout Disney World. 4)Mandarin Orange Vodka Lemonade at Disney’s Animal Kingdom. It is the perfect accompaniment to a pulled pork sandwich! 5) Beer. I’m not a huge beer drinker, but my husband is and I’m pretty sure he thought he died and went to heaven with the beer selection at Disney World. We last visited during the Food & Wine Festival, so there were more than the average amount of beers to choose from, but even during a normal time there are an abundance. If you or a member of your traveling party likes beer I highly suggest you check out www.beersandears.net (and their corresponding app, which was awesome to have in the parks) to see a list of available beers and their locations. Any drinks I missed? What should I try next? Join us this week as the girls discuss their picks for overrated and underrated attractions in Hollywood Studios. There are lots of surprises in this episode! There’s even a restaurant analysis you can’t afford to miss! 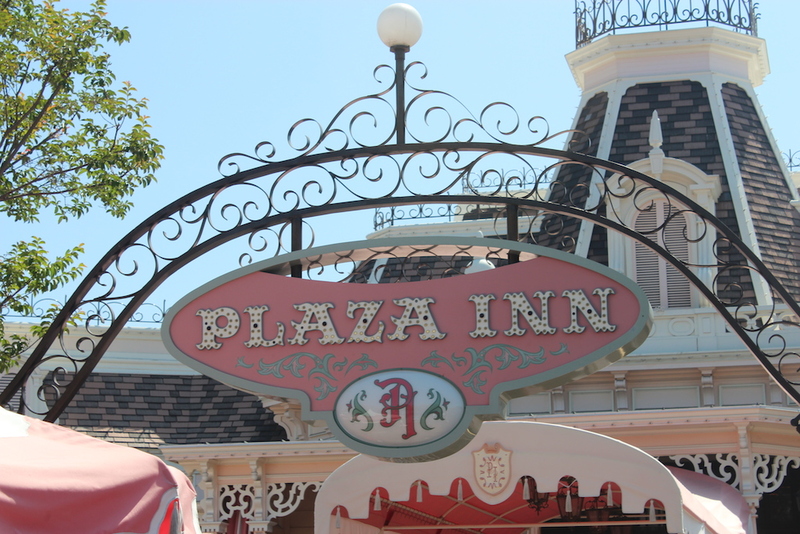 After brunch at The Plaza Inn, we headed back to the Disneyland Hotel. We rested and went for a swim. After our afternoon off we headed over to California Adventure. We had dinner at Paradise Pier: we got pizza and hot dogs from around the boardwalk area. Then we rode King Triton’s Carousel. My son loves riding the horses on any carousel and he didn’t seem to mind that these horses were all sea creatures. 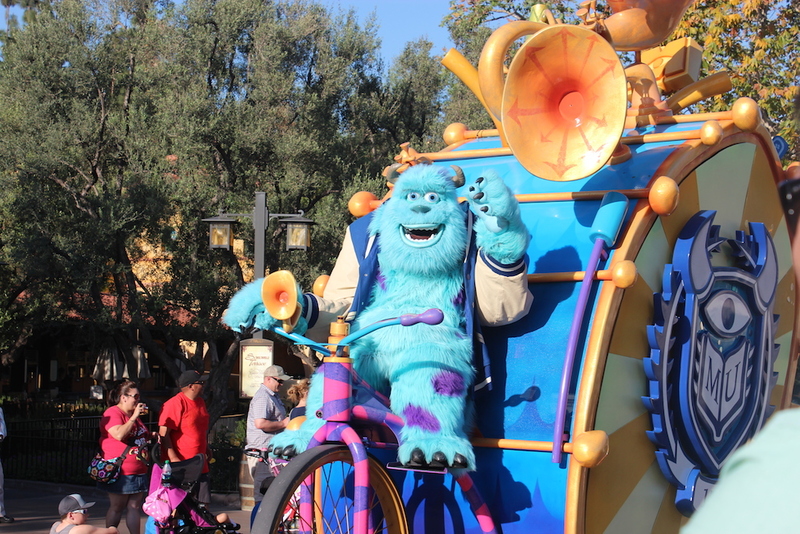 We literally walked right into the Pixar Pals Parade, so we stopped and let Anthony enjoy the characters from one of his favorite movies: Monsters University. After the parade we walked into Carsland. We were impressed from our first glimpse. We rode Luigi’s Flying Tires and Mater’s Junkyard Jamboree. We met Mater and Lightning McQueen and had ice cream at the Cozy Cone Motel. This new land was most definitely the highlight of the trip. 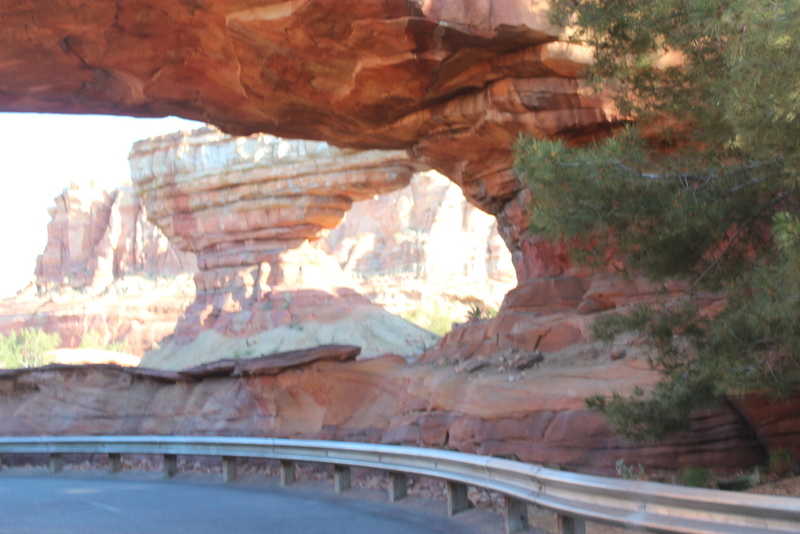 Now when we watch the movie, we say… it’s just like Carsland! 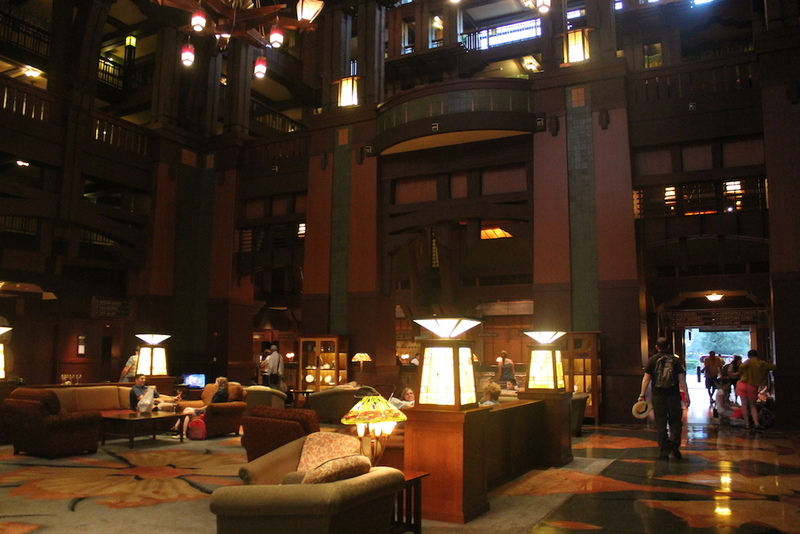 Once we called it a night we exited through the Grand Californian Hotel as a shortcut back to our hotel. 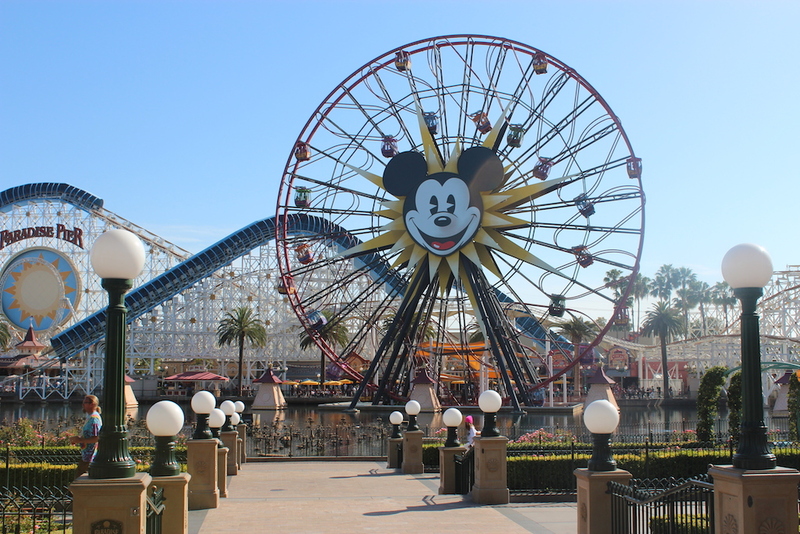 This is Part 3 of my Trip Report on our trip to Disneyland in April 2014. To read the rest of my report, click here to go to the table of contents. Have you ever considered a vacation to Disney and had someone say “Why? Your kid is too young and won’t remember it”? Rest assured you are not alone. Most of us here at Dole Whipped have had the same thing said to us and obviously we didn’t take that message to heart. There is no magic age that we can tell you but there are a couple reasons we can give to maybe help you make a decision. The first, and probably one of the most important is that children under the age of 3 are free at Disney. You don’t pay for them for the resort room (and they can still be in a pack and play), you don’t pay for food for them since they can eat off your plate, and finally you won’t pay park admission for them either. This is a huge cost saver for your vacation! Your child may not remember the vacation but you sure will! You will love to see them seeing Cinderella Castle or meeting Mickey Mouse for the first time. Those pictures are priceless and you will have a wonderful memory. Lastly, you know your child best so it will be up to your preferences. I personally had the best time taking my 3 year old for her first visit, but then our last visit she was 5 and it was even better. Some babies are perfectly content to be in a stroller or sling most of the day and that makes it easy to get them around the parks. So whether you wait until your child is 6 or 6 months old for their first visit there is never a bad time to take a child for their first visit. Join us this week as the Dole Whipped gang talk about which attractions at Epcot they think are overrated and which ones are underrated. We think you’ll be surprised by the answers. Hint: One of us thinks Soarin’ is overrated! Can you guess who thinks that? 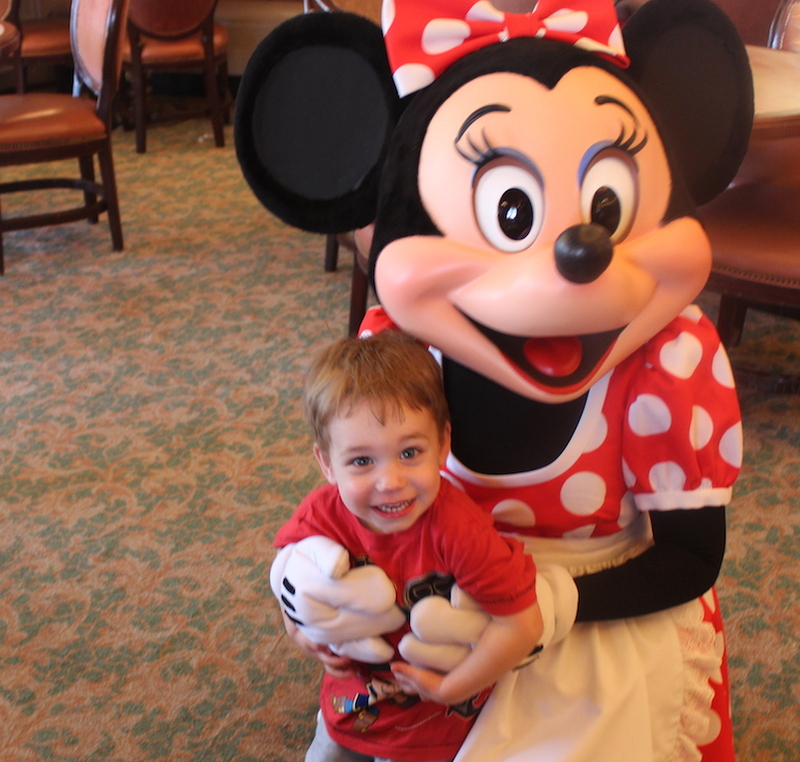 After our adventures in Toon Town, we made our way over to the Plaza Inn for the Minnie and Friends Character Breakfast. We prefer to have a late breakfast (this was at 11:00) to take advantage of when the parks are less crowded when they first open. Thus breakfast is more like lunch and it’s usually less expensive than a lunch sit-down. We had never eaten here before. I had purchased character meal vouchers before our trip that included the meal, tax and gratuity. When I checked in, they gave me my “coupons” and then when we walked in we “paid” with them immediately. I was confused as to why we paid first, since at all the buffets we’ve had at Disney World you pay at the end. Well, the reason why here: the food is cafeteria-style–even the drinks. So there is not much service involved. They may clear plates occasionally. The chef did come to our table due to my gluten allergy and brought me out everything from the kitchen since he was concerned about cross-contamination. My food was basic, I thought it was good. I had gluten-free Mickey waffles, fruit, eggs, and bacon. My husband and sister said that the food from the buffet was pretty mediocre but that wasn’t why I wanted to come here anyway. The reason I wanted to visit was because of the large number of characters this breakfast has. We met The Fairy Godmother, Chip and Dale, Susie the Mouse from Cinderella, Max from Goof Troop, Tigger, Eeyore, Minnie, Rafiki, and Captain Hook. That’s ten characters! And the interaction was phenomenal. It helped because since it was the end of service (having an 11 am ADR) there were not many people in the restaurant so the characters spent a lot of time with Anthony. 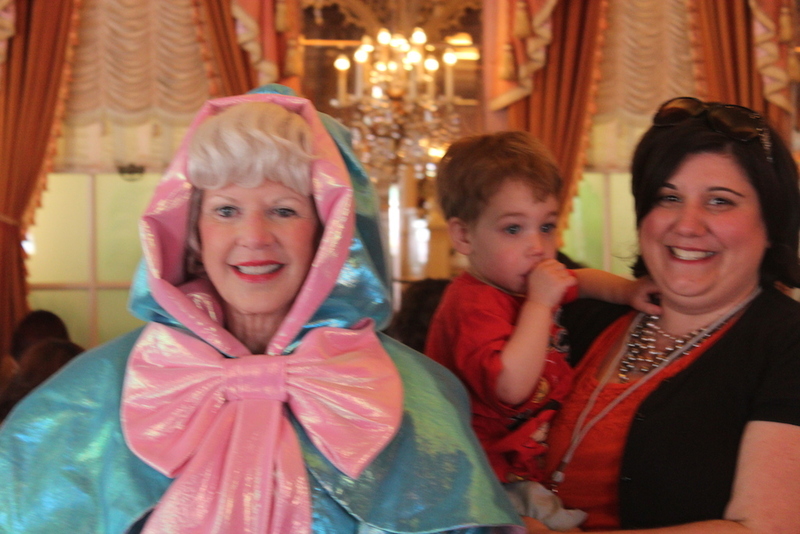 The Fairy Godmother visited first, I think I was more excited to see her than Anthony was. Cinderella was my favorite Disney movie growing up. Minnie got lots of hugs from Anthony, she is one of his favorites. 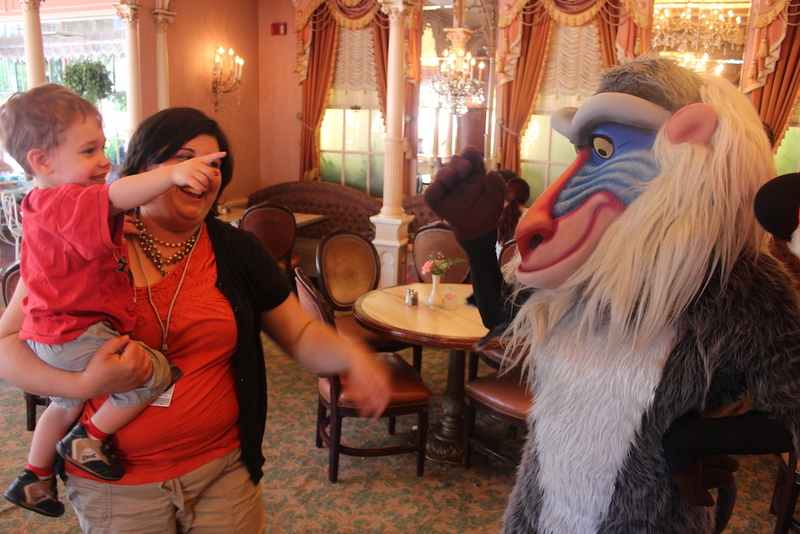 Anthony had NO IDEA who Rafiki was since he had never seen the Lion King, he was more interested in the Pooh characters. (PS- I am now in good standing as we own Lion King and he has seen it several times since this trip and now loves it.) 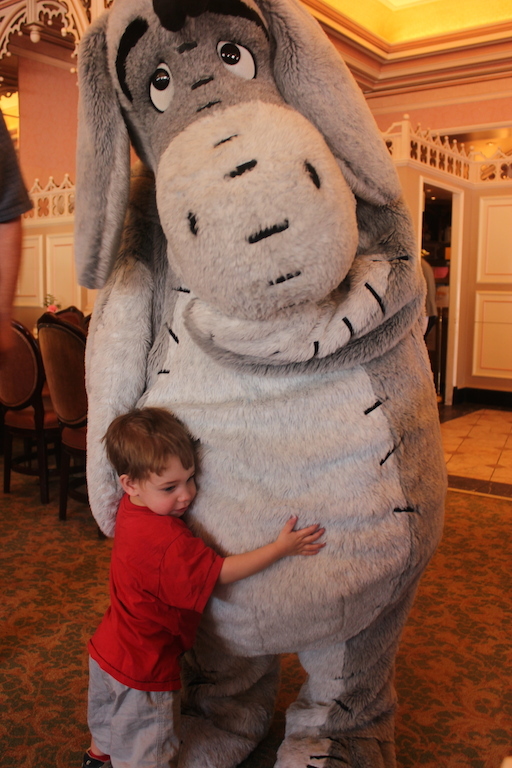 Anthony has loved Eeyore since he was a little baby. And would not stop hugging him here. 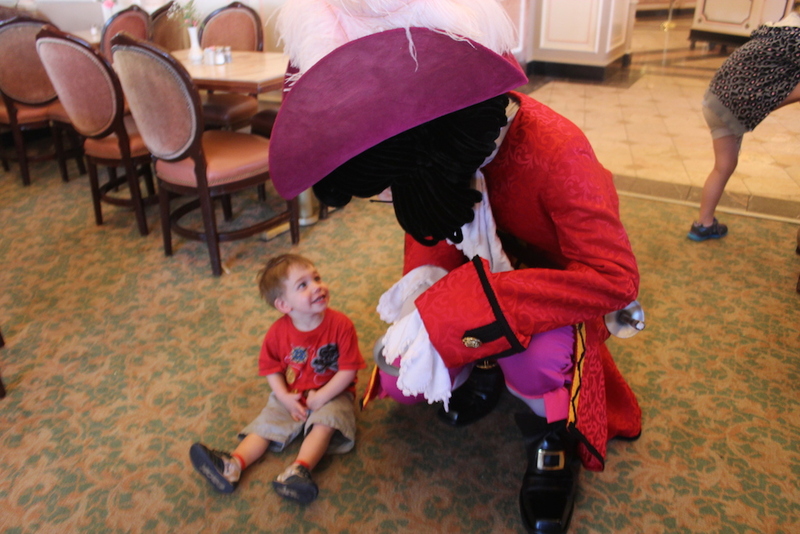 We ran into Peter Pan on our way into breakfast and he told us to tell Captain Hook about a surprise Pan has for him later. I believe he and Hook were discussing this topic during breakfast. 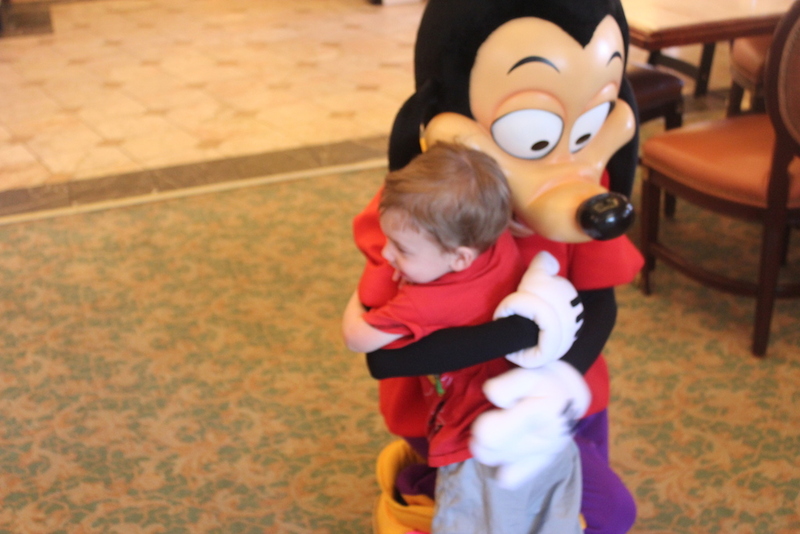 Anthony’s a huge fan of the Goofy movies so he recognized Max immediately and was full of hugs. Again, mom was more excited to see one of the mice from Cinderella than Anthony was! We had met Dale earlier in the meal. When Chip came over it was towards the end and Anthony was ready for a nap so he just sat on the carpet. 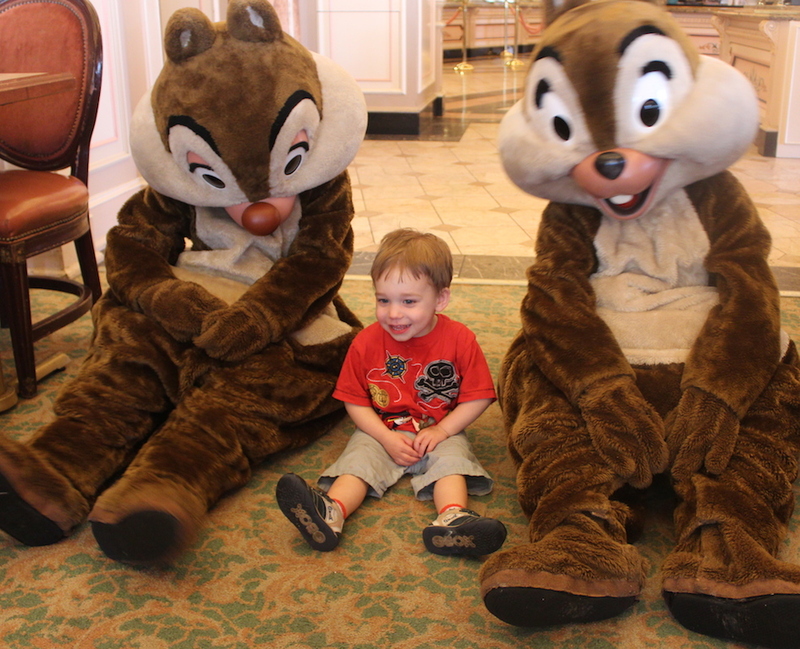 Chip sat right down next to him and then out of nowhere Dale came running over and Anthony was so incredibly happy. While the food was not stellar, the characters and how much time they spent with our son will be the reason we return here. I mean where else will you see Captain Hook and the Fairy God Mother in the same place? I definitely recommend a later seating to maybe get some extra character time. 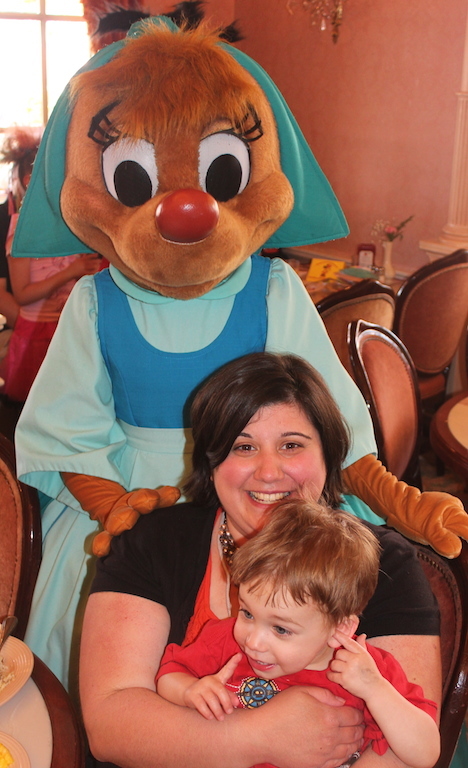 This is Part 2 in a series on my family’s trip to Disneyland. Keep a look out for Part 3 next week! If you would like to read other posts from this trip report, click here to go to the Table of Contents. 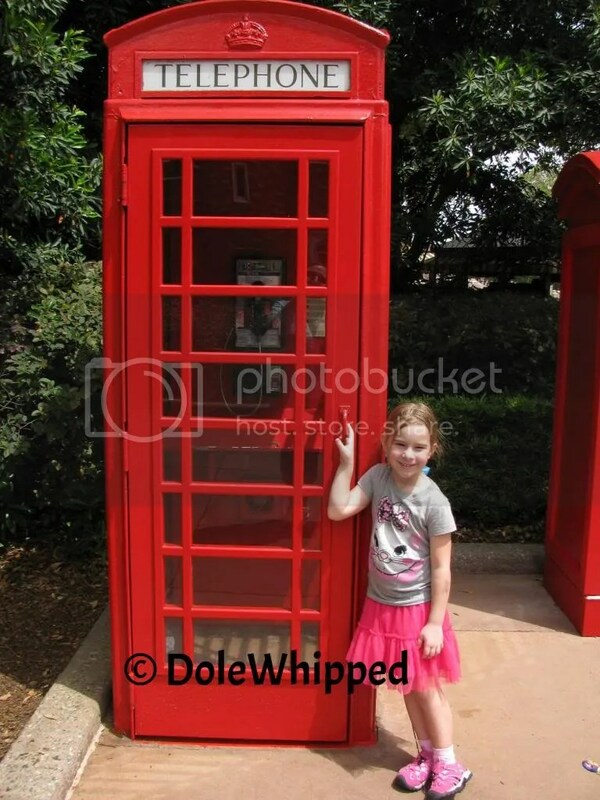 When planning a Disney vacation it’s important to find the resort that fits your needs and the needs of your family. That’s why I’m putting together a series of posts that help you decide which resort is right for you. You can feel like a true princess in these elegant surroundings located a short boat ride or monorail ride from the Magic Kingdom. Most rooms have two queen beds and a daybed. Plus, if you make reservations at 1900 Park Fare located on site, you can even have a meal with Cinderella without leaving your resort! For the littlest royals, there’s an Alice in Wonderland themed splash pad in the pool area. If you’re a fan of Princess Tiana, you definitely want to stay in this room outfitted with some amazing “princessy” touches. The centerpiece of this room is the light up LED headboard above each of the queen sized beds. With intricate carvings and plush carpets and even gold faucets shaped like the Genie’s lamp, your princess will feel pampered and right at home. If your princess is more at home under the sea, you’ll definitely feel like part of this world. 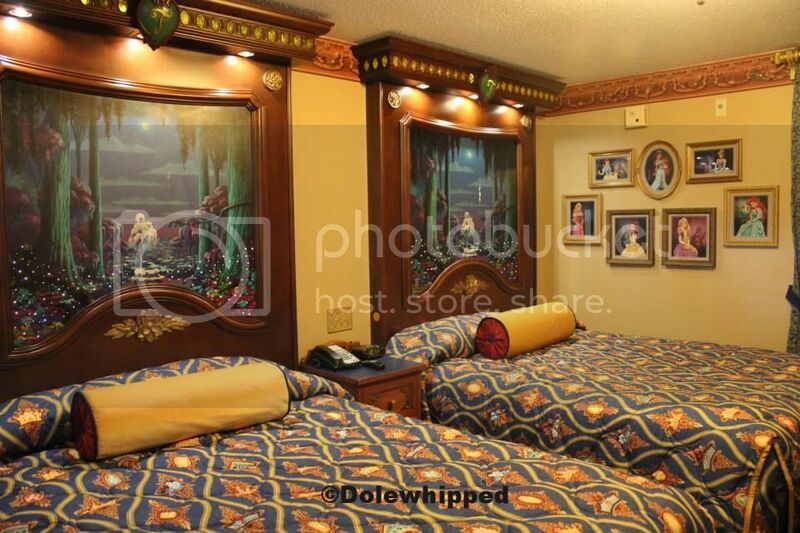 Fans of Ariel will adore the the attention to detail, like the seashell headboards, Prince Eric artwork, and the sheet music to Under The Sea embedded on the table. Rooms include either two double beds or one king bed. This resort includes the largest resort pool on Disney property. There are even speakers so you can listen to music under water! 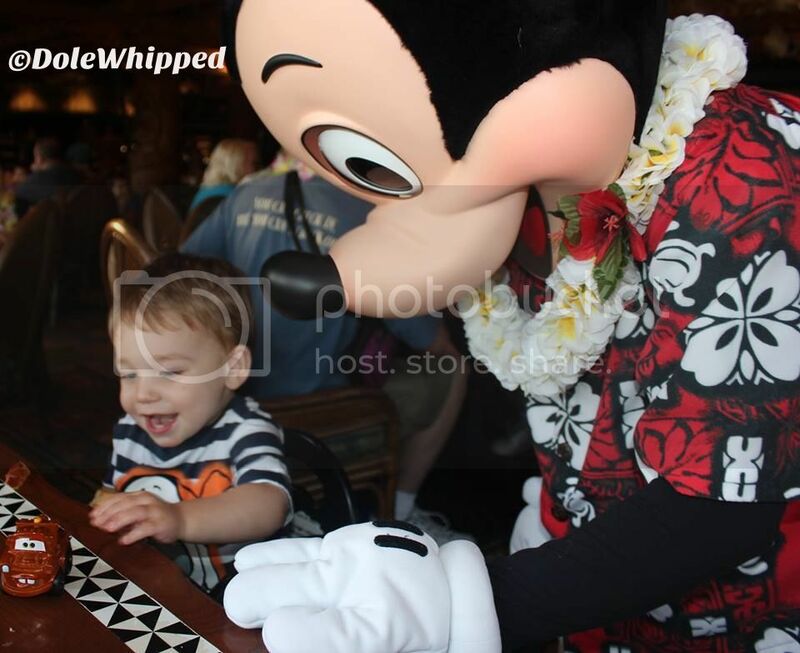 As always, one of the Dole Whipped team would be delighted to help you plan any aspect of your vacation. 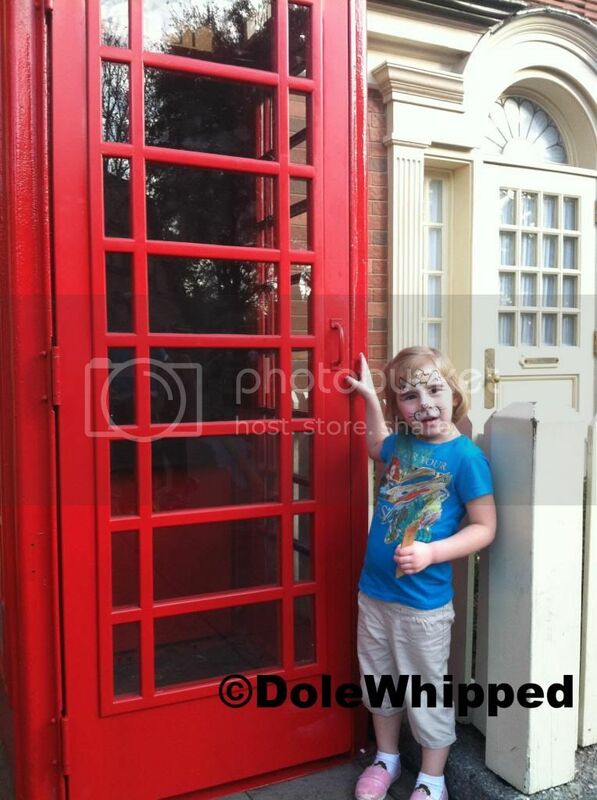 You can reach us at dolewhipped @ gmail.com.